Lee Shore Studio is a working artist studio, and this site is a Virtual Online Art Gallery. Owned by Artist, Christina M. Lee. 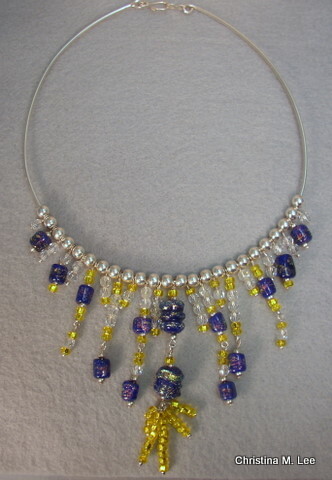 This is a Online Gallery where I showcase my “Elegant Art You Can Wear”. My one-of-a-kind original Jewelry Designs, created in fused glass, handmade beads (lampwork) and Precious Metal Clay, my original hand painted designs in 100% Silk, my off-wheel pottery, and my other fused glass creations. I would love to bring my jewelry, hand painted silks and fiber arts to your home and do a private jewelry trunk show for you and your friends, at no charge to you. Please contact me.